FIREFLY (61LM) 390LMD21K LiftMaster Compatible Mini Keychain Remote. Compatible with the Liftmaster 61LM 9 DIP Switch Remotes. Compatible with all Liftmaster Garage Door Openers with Dip Switches or a White, Gray or Yellow Learn Button. The Transmitter Solutions Firefly 390LMD21K mini keychain garage door opener remote from Garage door Supply Company is compatible with LiftMaster 61LM garage door receivers and other 390 MHz dip switch receivers. The Firefly is also compatible with most LiftMaster receivers with a white, gray or yellow learn button. Check your manual, or check with us, to confirm compatibility with your garage door operator receiver. The Firefly is only 1/2-inch by 1 7/8 inches by 1 1/2 inches in size. 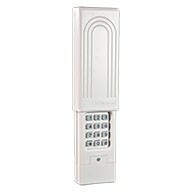 The 1-button remote has a keychain slot and LED indicator light. Dimensions: 1/2" x 1 7/8" x 1 1/2"
DOES NOT WORK WITH OLDER OPENERS THAT HAVE A YELLOW, WHITE or GRAY LEARN BUTTON ON THE MOTOR UNIT!